The eMetrics Marketing Optimization Summit was just a few weeks ago and I wanted to think back on the major outcomes I got out of my 12th eMetrics attendance. I didn't get to see all the presentations but one of the thing that strikes me is how often the terms "maturity model" and "analytics maturity" were mentioned by vendors, consultants and practitioners. The doubt of a few years ago, mainly stemming from strongly voiced opinions that maturity models are useless, is giving way to more serious interest. As organizations come to the conclusion that "web analytics is hard" they face two choices: keep complaining, blame the tools and the analysts, and gradually lose their interest in web analytics; or seek to diagnose what is wrong and act on it. All along, the spirit behind my work on the Online Analytics Maturity Model: to make organizations realize web analytics can be easy if we identify and understand what are our strong and weak points in our web analytics practices. The common pitfalls we are facing aren't unique to web analytics and the use of technologies such as online analytics to foster a cultural change needs to address several key process areas or they are bound to fail: Management, Scoping, Objectives, Process, the Team and lastly, the Technologies. I presented a session where we started with business strategy and drivers of success, did a detour toward creativity, and concluded with an online analytics maturity self-assessment. A keynote-style presentation which, based on the feedback I got from Jim Sterne and Matthew Finlay, scored a nice 4.27/5. Second to best! I also did the Roadmap to Online Analytics Success workshop - with great attendance from managers of all kinds of organizations. The feedback is always positive - with some tweaks to do here in there - mostly in the area of hands-on exercises and managing a tight schedule. When asked "Were your expectations met?" the answer from over a hundred participants so far is a resounding "yes!" (at 97%). 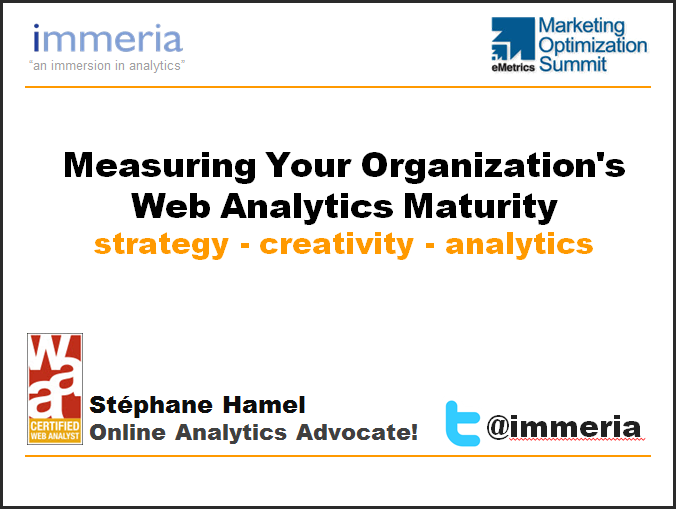 I'm already confirmed for a session and workshop at eMetrics San Francisco, March 13-18, 2011. Note: the session is a keynote-style session, with lots of imagery and few words - you need to be there to appreciate it. Therefore, the slide-deck is NOT available for download..
Interestingly, one of the symptom of a maturing industry is the number of people seeking to define key practices and drivers of success by defining models and frameworks. The actual state of our industry is a plethora of different models proposed by vendors (often biased by their own product offering) or consultants (biased by their own service offering) with varying range of credibility and rigor. Of course, having renowned author Tom Davenport publishing not one, but two books on analytics maturity is bound to raise interest. As good and inspiring Competing on Analytics and Analytics at work are, I'm of the opinion, and some of the feedback I got is confirming it, that what Davenport talks about is perceived as several years ahead of our "web" or "online" analytics realm. Still, those are two strongly recommended books - just don't think you can achieve the level of success he is talking about just because you installed Google Analytics a couple of months ago. 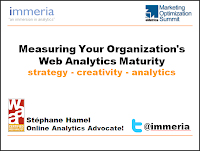 In the meantime... maybe it's worth taking a look at the Online Analytics Maturity Model? 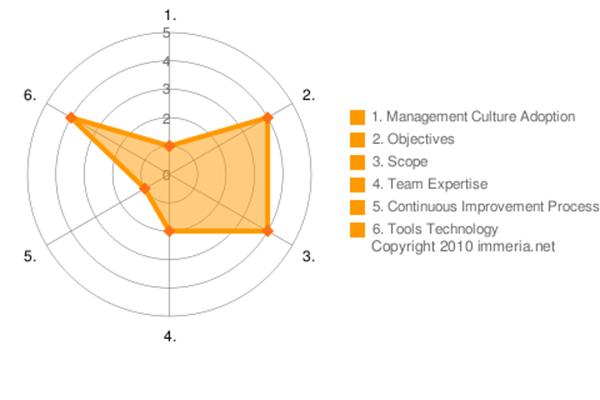 In order to pursue my work on the Online Analytics Maturity Model I was hoping to get some vendors and consultants to sponsor the work. Interest was high until they realized there would be no form of exclusivity. There is no value in having yet another vendor or agency-specific model, to the contrary, there is a huge need to lead, unite and foster the interests of industry practitioners, vendors, consultants and educators worldwide - exactly the mission of the Web Analytics Association. I still have some hopes of bringing the model under the WAA umbrella. Then again, this is easier said then done. Among the roadblocks are: some claimed it would cause undue bias toward a specific model; how can I protect the intellectual property and all the efforts I've put into it? ; and not the least important, how can this work and research be financed? If you have ideas, I would love to hear them!